Hooters hot wings make a different kind of hot wing than you normally find. Hooters hot wings are battered. Most hot wing recipes simply fry the wings. 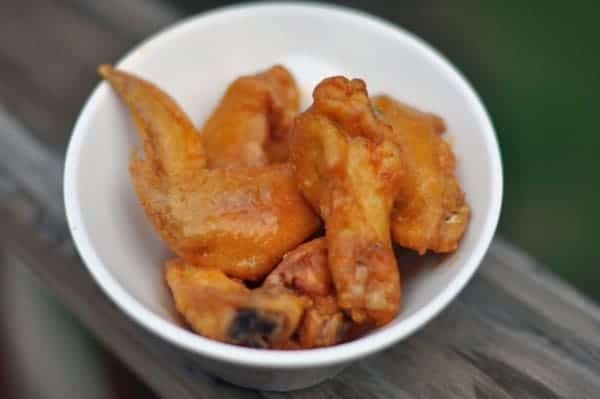 But, by adding this crispy batter to the Hooters hot wings, the outside of the wing gives you more flavor and more crunchy bits! Recreate Hooters Hot Wings at home. In a large mixing bowl, mix flours, salt, paprika and cayenne pepper together, and blend well. Cut chicken wings into drumettes and flappers. Wash and drain chicken. Coat chicken in flour mixture; refrigerate chicken wings for 90 minutes. When ready to deep fry chicken wings, heat oil to 375 degrees. Place chicken pieces in hot oil, but do not crowd. Fry chicken wings until golden brown. Remove from oil and drain. When all wings have been fried, place in a large bowl. Add Hot Sauce mixture and mix completely. Use a fork or tongs to place chicken pieces on a serving platter. Serve immediately and with lots of paper towels. I make my own sauce. I’ll melt one stick of butter then add one bottle of Louisiana Hot Sauce plus the juice of one lemon. I bring this to a rolling boil and that’s it. I like to use peanut oil for frying. I like to let the wings sit in buttermilk for a dew hours. Then, I’ll coat the wings, spread them out on some parchment paper and let them sit in the fridge overnight. Maybe a little bit extra work but the results really pay off. At least, that’s what the “eaters” tell me. We love wings and Hooters definitely has some tasty ones. Now we can enjoy them at home! I use “Hooters” breading found in the baking isle by the bread crumbs with the hooters wing sauce found by the BBQ and hot sauce. I have seen it for sale too. I don’t own a fryer,could I use over? I use a large saucepan with oil on the cooker top. Use a slotted spoon to drop wings/drumsticks in and to take them out again. Great tip, I never tried cotton seed oil before.